Mr. Frank Sasinowski has dedicated his career to helping patients and companies bring new therapies for rare diseases to market. He recently shared his work, his hopes for orphan drug development, and his advice for researchers and companies with HD Insights. The following is an edited transcript of the conversation. HD INSIGHTS: How did you become interested in orphan drug development? SASINOWSKI: I worked at the Food and Drug Administration (FDA) when Congress enacted the orphan drug law. I was asked to investigate how to make it work, because initially it wasn’t working. My research led to the 1984 and 1985 amendments to the original 1983 law that made it as positive, constructive, and beneficial as it has proven to be. I drafted the original implementing regulations before I left the FDA in 1987. After that, I helped companies through the FDA pre-approval gauntlet for getting new orphan drugs to the market and patients in need. Due to my experience with the orphan drug law, I had a particular passion for helping with therapies for patients who are afflicted with rare conditions. I had also worked on developing the accelerated approval track for therapies for AIDS, because in the mid-1980s, the AIDS crisis was upon us. Fast Track is essentially a way to get drugs approved on the basis of a surrogate endpoint, where the ultimate clinical endpoint can be proven in a confirmatory post-approval trial. I helped Berlex Pharmaceuticals (now Bayer Healthcare Pharmaceuticals) with Betaseron (interferon beta-1b), the first therapy approved for multiple sclerosis. Betaseron was the first therapy ever approved by the FDA for a condition other than AIDS or cancer that relied upon this new system for accelerated approval. It was really ground-breaking, not only for patients with multiple sclerosis, but also as a trail blazer for other FDA regulatory precedents. HD INSIGHTS: How did you become interested in HD? SASINOWSKI: I have a long history of working with HD therapies. I was involved in the Care-HD study, the largest HD study that had yet been conducted. I was actually there 15 years ago when Drs. Karl Kieburtz and Ira Shoulson, professors at the University of Rochester and principle investigators for the study, broke the blind and announced the results. I represented VitaLine, one of the two companies that had therapies being investigated. VitaLine’s Coenzyme Q10 (see HD Insights, Vol. 6) showed a 13% slower decline in the Total Function Capacity subscore of the Unified Huntington’s Disease Rating Scale (UHDRS) compared to placebo. This was startling to the investigators, because a 13% between-group difference was by far the largest they had ever witnessed. More recently, I helped Prestwick Pharmaceuticals with getting FDA approval for tetrabenazine for treatment of chorea associated with HD (see HD Insights, Vol. 7). The company showed positive results in a single trial on its primary endpoint, and an effect on global impression, a secondary endpoint, but the FDA was also impressed with patients’ stories. You will not find this talked about in the labeling for the product, nor if you scour the FDA medical reviews or statistical reviews. However, we found in our interactions with the FDA that they were impressed by anecdotal reports that some patients whose chorea was so severe that they needed help in feeding themselves were able to self-feed after treatment with tetrabenazine. This demonstrates that the FDA wants to see that a therapy is going to improve how a patient feels or functions on a daily basis, or survives. Also related to HD, I aided Avanir Pharmaceuticals with its dextromethorphan and quinidine (NUEDEXTA®) therapy for pseudobulbar affect, which was approved in 2010. Significantly, this was before the FDA Safety and Innovation Act (FDASIA) of July 8th, 2012, which represents the first time in the history of our drug laws that the word “patient” appears. Our drug law started with the 1906 Pure Food and Drug Act, and one would think that in over a century of law-making, it would be impossible that the law would never mention patients, but it is true. Congress relied on the medical community and the regulators to decide what was best for patients. There was a shift in 2012, and Congress told the FDA—and in effect the medical and patient communities—that patients need to have a role in approval of new drugs. I have had about 10 meetings this year with the FDA division of neurology, and they want companies not just to rely upon measurements of physiological outcomes that have an unclear connection with a patient’s daily life, but to discover how a new therapy affects how that patient is feeling on a daily basis, and how they are engaging in their activities of daily living. HD INSIGHTS: The Orphan Drug Act has been a great policy success. What are some of the remaining policy and regulatory challenges, especially as they might apply to HD? HD INSIGHTS: Are there current examples of this engagement in development of therapies for orphan neurological conditions? SASINOWSKI: One of my fellow NORD board members, Pat Furlong, is the founder of a group called Parent Project Muscular Dystrophy. They devised their own draft guidelines on developing therapies for Duchenne muscular dystrophy and presented them to the FDA, who published the guidelines for public comment. 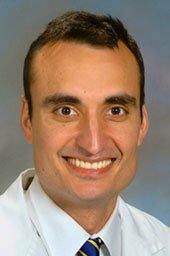 That is an example of a patient-driven, patient-initiated effort to help define what key elements should be considered, what populations should be enrolled in studies, what kind of endpoints should be considered, and what kind of safety risks should be prominently and sensitively monitored. I’ll give you one more example. About a year ago, the FDA published a guidance document on migraine that said in effect, “We all know that the most prominent feature of migraine is pain, but we need to have other symptoms that will be relieved by any therapy in development, because we do not want to approve drugs such as opioids that might treat only pain. There are three or four other prominent symptoms such as photophobia, phonophobia, nausea, and vomiting. Why don’t you, as a sponsor, let each patient decide for themselves what is the most bothersome second symptom?” Why is this different? Let’s say you have a therapy and you need to come up with a second endpoint, aside from pain. Normally, you would say, “Well, maybe it’s photophobia, so I need only screen those who say that their most prominent second feature is light sensitivity.” Thus, you enrich your study population with those who are just light sensitive, and then ask, “How did you do on pain?” and “How did you do on light sensitivity?” and hopefully show a difference. But you have severely limited who can enroll in your trials. The FDA is saying, “Open the floodgates, let them all in, but let them define for themselves what is the most troublesome second symptom after pain,” demonstrating a sensitivity to letting patients drive the drug development system. HD INSIGHTS: In 2012, you published an analysis of FDA approvals for rare and orphan diseases, demonstrating variability in the application of evidence standards.1 What are the implications of your research for companies that are developing drugs for rare and orphan diseases? SASINOWSKI: The exchanges that I routinely heard at public advisory committee hearings for orphan drugs would baffle me. Normally, sponsors need two adequate, well-controlled studies that each hit a P value of less than 0.05 on the primary endpoint in order to even talk to the FDA about approval. For an orphan disease, the sponsor would often come in with something short of that. The chairman of the committee would turn to the FDA and say, “We know that this is not a situation like a new drug for treating hypercholesterolemia or high blood pressure, where you have an unlimited pool of potential subjects to enroll in trials. We know that there are severe constraints on who can be enrolled. So what are we to do with this?” The FDA would answer, “The Orphan Drug Act did not change the rules for how much evidence of treatment benefit needs to be presented for drug approval.” This left the advisory committee in a quandary, because it seemed that they should be more flexible, but the FDA said that the law did not allow it. This bothered me. When the FDA held its first-ever public hearing on orphan drugs in June 2010, I was invited to speak on behalf of NORD. I said that the FDA ought to articulate a policy that explains how they would deal with this conundrum. The Orphan Drug Act did not change the quantum of evidence that is required for drug approval, but every orphan drug is different and every rare disease patient population is different. I suggested that if they could not enunciate a generalized statement of policy, at a minimum they could catalogue everything done with all the orphan drugs so that the world could see what has happened over time and what the evidentiary basis had been for all prior orphan drug approvals by FDA. HD INSIGHTS: Is there any advice that you have for HD researchers or drug developers regarding current regulatory matters in front of the FDA? SASINOWSKI: I think that the FDA is being extraordinarily sensitive to the needs of individuals who suffer from rare, chronic, debilitating, life-threatening diseases such as HD. Sponsors should realize that working with the FDA is extremely beneficial. For researchers and patients, it is important to think about ways to deepen an understanding of the natural history of the disease. We need collaboration between patients and the research community to figure out ways in which everyone will measure the same things under the same conditions. Currently, there is tremendous incentive for people to come up with their own ways of doing things; every major research institution wants to have its fingerprint so that it can publish a paper that says, “This is how we do it.” That doesn’t help, because that means everybody is evaluating everything differently. HD INSIGHTS: When you are not helping companies develop treatments for orphan diseases, how do you spend your time? SASINOWSKI: I recently set up a program called One Wednesday, which hosts community gatherings for 30 minutes of silence every month. Looking at the suffering of patients tells me that we live in a divided world; we divide ourselves between healthy and unhealthy, between economic classes, political factions, religions and even within religions. One Wednesday is one effort to try to bring people to understand a fundamental truth, and that is that we all are one. HD INSIGHTS: Thank you for all your efforts to help us get better treatments for individuals suffering with rare conditions. 1Sasinowski FJ. Quantum of effectiveness evidence in FDA’s approval of orphan drugs: cataloging FDA’s flexibility in regulating therapies for persons with rare disorders. Drug Information Journal. 2012; 46(2):238-263. 2Sasinowski FJ, Panico EB, Valentine JE. Quantum of Effectiveness Evidence in FDA’s Approval of Orphan Drugs: Update, July 2010 to June 2014. Therapeutic Innovation & Regulatory Science. 2015. Orphan diseases are rare conditions which affect less than 200,000 individuals in the United States. The NIH Office of Rare Diseases website currently lists over 7,000 orphan conditions that affect a total of 25-30 million individuals in the US. 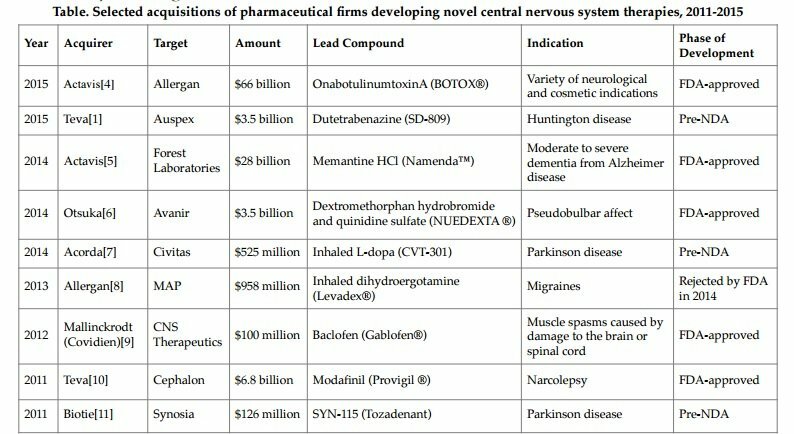 Approximately one-fifth of these conditions are neurological.1 The 1983 Orphan Drug Act encourages pharmaceutical firms to develop new therapies for orphan diseases through several incentive programs, including tax breaks, grant funding, FDA fee waivers, and longer market exclusivity for companies. 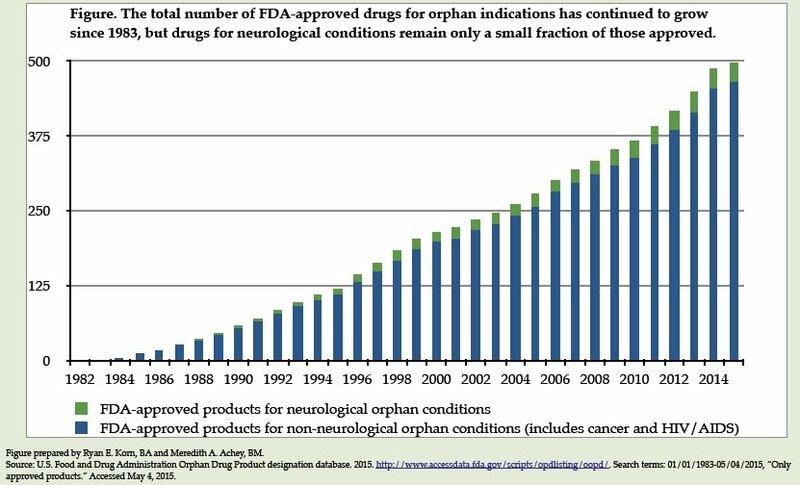 In the 32 years since the passage of the Orphan Drug Act, the FDA has issued approvals for 463 orphan indications (some compounds are approved for multiple indications), 34 of which are for neurological conditions (see Figure).2 Only one, tetrabenazine, is for HD. 1Murphy SM, Puwanant A, Griggs RC. Unintended effects of orphan product designation for rare neurological diseases. Ann Neurol 2012;72:481-90. 2U.S. Food and Drug Administration (FDA). Orphan Drug Product designation database. Available from accessdata.fda.gov/scripts/opdlisting/oopd/. Accessed May 4, 2015. Generating GABAergic medium-sized spiny neurons (MSNs) from human pluripotent stem cell (hPSC) sources is a rapidly evolving technique that holds much promise for HD modeling and treatment. Arber and colleagues describe a new method of differentiating hPSCs to MSNs using Activin A (activin).1 Activin is part of the transforming growth factor beta signaling pathway, involved in neurogenesis and neuronal cell type fate. Arber’s paper describes the ability of activin to produce a much higher proportion of MSNs than current techniques, and the ability of these neurons to survive in grafts in rodent models of HD. Dr. Ihn Sik Seong’s group makes an elegant cell model of HD using embryonic stem cells, producing six isogenic lines from one lineage. One line expresses two copies of wild-type mouse huntingtin (Htt) (Q7), an Htt null line, while four heterozygous lines express one Q7 allele and one CAG expanded allele of 20, 50, 91, or 111 CAG repeats.2 This paper explores histone modifications in the presence of mHtt and Htt, based on research indicating that Htt acts as a polycomb recessive complex-2 facilitator. The authors show subtle alterations to the chromatin landscape and histone methylation states depending on whether Htt or mHtt is present, and whether cells are in a pluripotent or differentiated state. Mattis and his group used HD-patient-derived induced pluripotent stem cells produced from non-integrating technology to assess how HD and juvenile-onset HD CAG repeat lengths affect neuronal differentiation.3 The group found a significantly higher proportion of nestin-positive cells in cultures derived from JHD patients after 42 days of differentiation. Cells with juvenile-onset HD CAG repeat length suffer an increase in cell death with brain-derived neurotrophic factor withdrawal, due to glutamate toxicity. The authors posit that this increase may be mediated through the TrkB receptor. 1Arber C, Precious SV, Cambray S, et al. Activin A directs striatal projection neuron differentiation of human pluripotent stem cells. Development. 2015Apr 1; 142(7):1375-86. 2Biagioli M, Ferrari F, Mendenhall EM, et al. Htt CAG repeat expansion confers pleiotropic gains of mutant huntingtin function in chromatin regulation. Hum Mol Genet. 2015 May 1; 24(9):2442-57. A recent study assesses the clinical manifestation of HD in patients who express intermediate CAG repeat lengths.1 A group led by Panegyres examined subjects who had repeats in the 27–35 range (at risk for prodromal HD), 36–39 range (mixed penetrance), or 40+ range (HD). No patients with CAG repeat length below 35 developed manifest HD. Smoking and being older than 65 correlated with manifest HD among those with intermediate repeat lengths. Of note, a high level of education was associated with lower odds of manifest HD, and the authors propose several hypotheses about environmental, cognitive or epigenetic factors. A paper by Hobbs and colleagues in a group led by Prof. Sarah Tabrizi assessed candidate outcomes in HD patients in the imaging, clinical and cognitive streams, at both short (six-month) and longer (15-month) time periods, in order to further the guidelines for assessing outcomes in HD clinical trials.2 This is the first study to report significant effect size in short time periods. The strongest longitudinal changes were present in caudate atrophy and ventricular expansion. 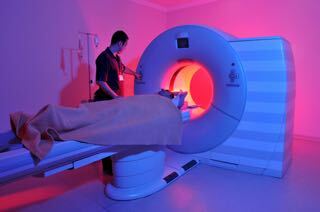 Small effect sizes were noted in other imaging and clinical measures that will be useful over longer time periods. To date, there have been few studies assessing changes in the hypothalamus, a brain structure that may be responsible for the sleep, emotional and metabolic changes associated with HD. Hypothalamic changes are noted up to 15 years before predicted onset of manifest HD. In a recent PLoS One article, 3 Gabery and colleagues explored whether alterations to hypothalamic volume may be linked to these symptoms. Using 3T-MRI image data from IMAGE-HD, the group compared hypothalamic volume between patients before and after onset of manifest HD. The group did not find any statistically significant alterations in hypothalamic volume, indicating that the hypothalamic changes noted in previous studies are not likely due to atrophy. 1Panegyres PK, Shu CC, Chen HY, Paulsen JS. Factors influencing the clinical expression of intermediate CAG repeat length mutations of the Huntington’s disease gene. J Neurol, 2015. 262(2): p. 277-84. 3Gabery S, Georgiou-Karistianis N, Lundh SH, et al. Volumetric analysis of the hypothalamus in Huntington Disease using 3T MRI: the IMAGE-HD Study. PLoS One, 2015. 10(2): p. e0117593. Wild and colleagues report in the Journal of Clinical Investigation on an ultra-sensitive method of quantifying mHTT levels in the cerebrospinal fluid (CSF) of HD patients.1 Using a single-molecule counting immunoassay based on the MW1 antibody specific for the expanded CAG tract, the group demonstrated the ability to detect mHTT in a disease-and onset-dependent manner in the CSF of HD patients in two cohorts. This assay will be useful as a pharmacodynamic biomarker in clinical trials, specifically in trials assessing HTT-lowering strategies. It has been shown that allele-specific silencing of mHTT can be successful using small interfering RNA (siRNA) targeting the expanded CAG tract, or single nucleotide polymorphisms associated with the mHTT allele. The Davidson group aimed to explore whether specificity for the mHTT allele was maintained when previously tested siRNA sequences were moved into the group’s artificial mRNA expression system.2 This mRNA expression system may be more amenable to sustained delivery of knockdown than previously tested methods of in vivo knockdown. 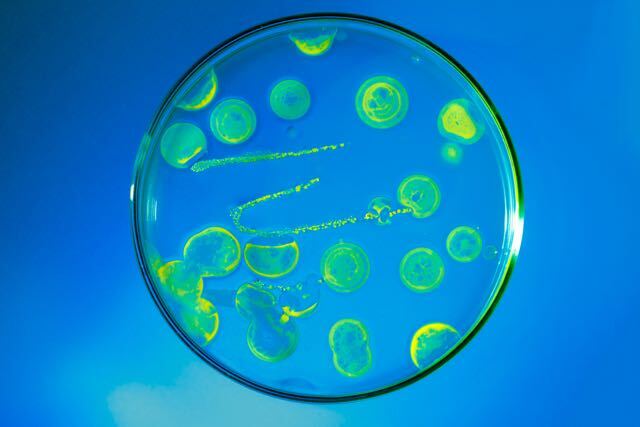 The group tested their system both in vitro and in vivo, and found that only some of the previously tested sequences were efficacious long term. A report published in Nature Chemical Biology by Jimenez-Sanchez and colleagues describes a new therapeutic HD target extracted from an siRNA screen focusing on genes that are amenable to small molecule modulation.3 The most significant suppressor of mHTT toxicity was glutaminyl-peptide cyclotransferase (QPCT), an enzyme with glutaminyl cyclase activity. The knockdown of this protein inhibits mHTT aggregation, while overexpression exacerbates aggregation. Using pharmacophore models and other known structures, the group designed QPCT inhibitors. These inhibitors have positive effects in several models of HD, and with further development may become clinically relevant. 2Monteys AM, Wilson MJ, Boudreau RL, et al. Artificial miRNAs targeting mutant huntingtin show preferential silencing in vitro and in vivo. Mol Ther Nucleic Acids. 2015 Apr 7;4:e234. doi: 10.1038/ mtna.2015.7. 3Jimenez-Sanchez M, Lam W, Hannus M, et al. siRNA screen identifies QPCT as a druggable target for Huntington’s disease. Nat Chem Biol. 2015 May;11(5):347-54. Welcome to the 11th edition of HD Insights. We are pleased to continue our mission to promote, disseminate, and facilitate research in Huntington disease. We are grateful to the Huntington Study Group (HSG), our sponsors, and our more than 2800 subscribers for their continuing support. This issue investigates potential therapeutic strategies for HD treatment and provides a detailed update on disease-modifying strategies set to enter clinical trials in the upcoming year. We discuss Teva’s recent acquisition of Auspex following the promising results of FIRST-HD released earlier this year. We bring you an interview with former FDA attorney Mr. Frank Sasinowski, on his work with the 1983 Orphan Drug Act, his hopes for orphan drug development, and his advice for researchers and companies working to develop new therapies for rare diseases. Dr. Shaun Sanders describes the therapeutic potential of increasing palmitoylation of mHTT, thereby decreasing its toxicity and aggregation within HD patients. Dr. Dagmar Ehrnhoefer details several studies showing that wild-type HTT plays an important role in myristoylation and autophagy, and promotes the clearance of misfolded mHTT. Dr. Lise Munsie summarizes ongoing HD research and Dr. Daniel Zielonka discusses promising diseasemodifying strategies aimed at lowering HTT. Dr. Francesca Cicchetti shares the highlights of February’s CHDI meeting. Finally, we continue to provide an up-to-date status report on ongoing and recently concluded HD clinical trials. The HD Insights team continues to rely on the support of firms dedicated to developing novel treatments to support our efforts to reach and educate the international HD research community. If you are interested in becoming a supporter, please contact me at editor@hdinsights.org. We welcome new contributors, suggestions for topics, and ideas about how we can better serve you. If you or someone you know would like to share their ideas with over 2800 HD researchers and clinicians around the world, please contact me at editor@hdinsights.org . Finally, subscription to HD Insights is always free: simply send us an email at subscribe@hdinsights.org. HD DISCLOSURES: DR. DORSEY RECEIVES GRANT SUPPORT FROM AUSPEX PHARMACEUTICALS, THE HUNTINGTON STUDY GROUP, AND PRANA BIOTECHNOLOGY. More than 20 years after the identification of the wildtype HTT gene and the mutated allele (mHTT) that causes HD, we still have no cure, although there are a few therapeutic options for HD symptoms. The most promising disease-modifying strategies on the horizon focus on HTT lowering (Figure), and some examples of these strategies are set to enter clinical trials this year. Gene silencing approaches that use small interfering RNA (siRNA) or antisense oligonucleotides (ASOs) to selectively suppress mRNA production also demonstrate significant potential for disease modification. siRNAs and ASOs have both been shown to be safe and effective in HD mouse models, and are now entering human trials. Significant challenges remain for the delivery of these compounds to the human central nervous system (CNS), however, because these compounds cannot cross the blood-brain-barrier. Therefore, vector-assisted, intraparenchymal, intra-cerebro-ventricular, and intrathecal delivery methods are all being explored. Intrathecal delivery appears to be easier and less invasive than other methods. In preclinical testing conducted by Isis Pharmaceuticals, mHtt expression in mouse models was suppressed by up to 52% in the cortex, 64% in the spinal cord, and 20% in the caudate nucleus with an intrathecal ASO called Isis HTT-Rx®. A phase I clinical trial will begin this year to evaluate the compound’s safety in humans. Alnylam Pharmaceuticals and Medtronic have developed an implantable pump infusion system to deliver ALN-HTT®, an siRNA-based therapeutic, into the putamen. The pump infusion system comprises an experimental catheter and the commercially available Medtronic SynchroMed II® pump. The companies believe that siRNAs will be evenly distributed between the striatum and other regions of the brain.2 This approach was validated in Rhesus monkeys with a continuous infusion of siRNA over 7 days, leading to a 45% reduction of HTT mRNA in the putamen. Finally, Roche recently described a new delivery approach using a monovalent molecular shuttle they call a “Brain Shuttle” that modifies the binding mode of an antibody to the transferring receptor and increases blood-brain barrier transcytosis.3 Their study demonstrated a 55-fold increase in target engagement using the “Brain Shuttle” to deliver antibodies to beta amyloid in a mouse model of Alzheimer disease. This shuttle system may have the potential to deliver mHTT-silencing compounds in a less invasive manner than those mentioned above. Several disease-modifying therapies for HD currently in development focus on selectively lowering mHTT in the CNS. As the challenges of CNS delivery and distribution are addressed, the possibility of slowing or reversing the effects of mHTT production may become a reality. For further reading, please see Dr. Zielonka and colleagues’ “Update on Huntington’s disease: Advances in care and emerging therapeutic options,” published in the March 2015 edition of Parkinsonism and Related Disorders. 1Garriga-Canut M, Agustín-Pavón C, Herrmann F, Sánchez A, et al. Synthetic zinc finger repressors reduce mutant huntingtin expression in the brain of R6/2 mice. Proc Natl Acad Sci USA. 2012 Nov 6;109(45):E3136-45. 2Zhang Y, Friedlander RM. Using non-coding small RNAs to develop therapies for Huntington’s disease. Gene Ther. 2011 Dec; 18(12):1139-49. 3Niewoehner J, Bohrmann B, Collin L, et al. Increased brain penetration and potency of a therapeutic antibody using a monovalent molecular shuttle. Neuron. 2014 Jan 8; 81(1):49-60. Mutant huntingtin (mHTT) is the direct cause of HD, and many exciting new treatment strategies are aimed at lowering its levels. The primary approach is to prevent generation of mHTT. However, there are also intracellular mechanisms to clear mHTT once it has been generated, and even mHTT aggregates can be degraded. The mechanism for this is autophagy, meaning “self-eating.” Autophagy requires cargo proteins to be tagged with an autophagy adaptor protein such as p62, which then links the tagged protein to a membrane structure that slowly closes in around both adaptor and cargo. This autophagic membrane vesicle, called an autophagosome, then undergoes a series of degradation steps to finally clear the cell of unwanted dysfunctional or mutant proteins. 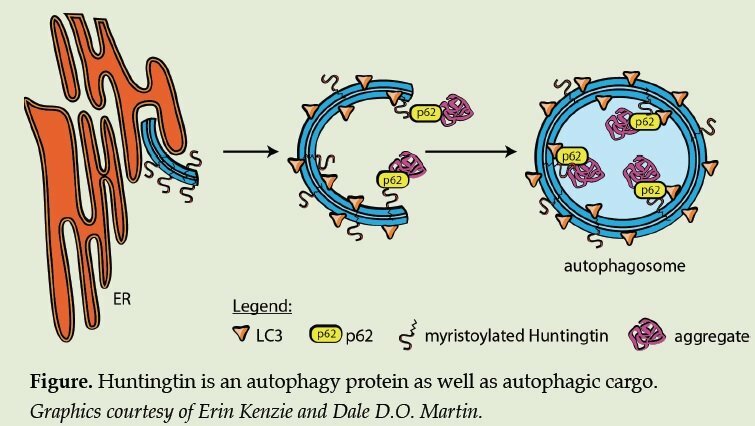 It has been known for some time that autophagy is impaired in HD, and that this impairment contributes to the accumulation of mHTT and its aggregates. In fact, the chemical up-regulation of autophagy has shown beneficial effects in mouse and Drosophila models of HD.1 However, there is substantial evidence to suggest that in HD, cargo proteins are not efficiently loaded into autophagosomes2, a defect that must first be corrected before mHTT degradation can take place efficiently. 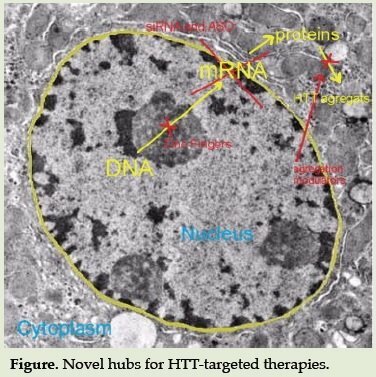 In addition, two independent studies have shown that HTT can act as a scaffold in autophagy initiation, bringing together the autophagy adaptor protein p62 and ULK1, a kinase that initiates autophagy.7, 8 The regions of the HTT protein that are required for binding p62 and ULK1 are at the C-terminus, distal from the aa586 caspase cleavage site. All data taken together suggest that cleavage of HTT at aa586 separates the myristoylated ‘membrane-anchor’ (aa553) from other, more C-terminal domains crucial for the interaction of HTT with other autophagy proteins.6 Since mHTT is both cargo and part of the autophagic machinery, a more detailed investigation of these pathways and how they are disrupted in the presence of mHTT could identify therapeutic targets to increase the autophagic clearance of mHTT, a promising approach to lowering overall levels of mHTT. 1Renna M, Jimenez-Sanchez M, Sarkar S, Rubinsztein DC. Chemical inducers of autophagy that enhance the clearance of mutant proteins in neurodegenerative diseases J Biol Chem. 2010 Apr 9; 285(15):11061-7. 2Wong E, Cuervo AM. Autophagy gone awry in neurodegenerative diseases. Nat Neurosci. 2010 Jul;13(7):805-11. 3Martin DD, Heit RJ, Yap MC, et al. Identification of a posttranslationally myristoylated autophagy-inducing domain released by caspase cleavage of huntingtin. Hum Mol Genet. 2014 Jun 15;23(12):3166-79. 4Graham RK, Deng Y, Carroll J, et al. Cleavage at the 586 amino acid caspase-6 site in mutant huntingtin influences caspase-6 activation in vivo. J Neurosci. 2010 Nov 10;30(45):15019-29. 5Graham RK, Deng Y, Slow EJ, et al. Cleavage at the caspase-6 site is required for neuronal dysfunction and degeneration due to mutant huntingtin. Cell. 2006 Jun 16;125(6): 1179-91. 6Martin DD, Ladha S, Ehrnhoefer DE, Hayden MR. Autophagy in Huntington disease and huntingtin in autophagy. Trends Neurosci. 2015 Jan;38(1):26-35. Dr. Michael Hayden, President of Global R&D and Chief Scientific Officer at Teva, told HD Insights, “Teva has a longstanding commitment to patients and clinicians in the HD community. The acquisition of Auspex represents an exciting new dimension to Teva’s deep focus in this field, and adds to the broadest and most ambitious development portfolio in the industry.” Teva has two ongoing phase II HD clinical trials: the LEGATO-HD study of laquinimod (see HD Insights, Vol. 10), and the PRIDE-HD trial of pridopidine. Teva’s large, international development infrastructure is expected to allow faster development and distribution of Auspex’s deuterated compounds. 1 Teva Reinforces Leadership Position in CNS with Acquisition of Auspex [Internet]. March 30, 2015. Available from: tevapharm.com/news/?itemid=%7BF45C98FD-CEA7-48C4- B9CB-A6BD00D0BEDB%7D. 2 Auspex Pharmaceuticals. Pipeline – Auspex Pharmaceuticals 2015 [May 8, 2015]. Available from: auspexpharma.com/ pipeline/. 11 Biotie to Acquire CNS Therapeutics Firm Synosia in €93.6M All-Shares Deal [Internet]. Online; January 11, 2011. Available from: genengnews.com/gen-news-highlights/biotie-to-acquirecns-therapeutics-firm-synosia-in-93-6m-all-b-b/81244507/ Table. Much of our current understanding of the functions of wildtype HTT and of the pathological processes of mHTT comes from studies involving its interacting partners. Many studies seek to determine the full spectrum of HTT interacting proteins (HIPs) and to understand how their interactions are altered by mHTT, since interactions altered by mHTT may contribute to HD.1-3 In particular, HIP14 (DHHC17) and HIP14L’s (HIP14-like or DHHC13) interactions with HTT are inversely related to polyglutamine tract length.4,5 These findings prompted further investigation into the role that these two proteins play in HD. HIP14 and HIP14L belong to a family of enzymes called DHHCdomain-containing palmitoyl acyltransferases (PATs).6,7 PATs mediate palmitoylation, the reversible, post-translational addition of the 16-carbon fatty acid palmitate to cysteine residues on proteins.8,9 HTT is palmitoylated by HIP14 and HIP14L7,10 on cysteine 214 (see Figure), but interestingly, mHTT is less palmitoylated.11 Humans have 23 PATs. HIP14 and HIP14L are the only two that have N-terminal ankyrin repeat domains6 that mediate the interaction with HTT.10 HTT undergoes many different types of post-translational modifications, many of which are altered in the presence of mHTT. This is believed to contribute to mHTT toxicity and cell death.12 Indeed, loss of palmitoylation of mHTT increases its toxicity and aggregation.11 Therefore, increasing palmitoylation is a potential therapeutic strategy for HD treatment. There is mounting evidence that aberrant palmitoylation plays a role in HD. However, it is difficult to target HIP14 or HIP14L to increase their activity and thereby increase palmitoylation of HTT and other substrates. A second group of enzymes, acyl protein thioesterases (APTs), mediate depalmitoylation and may be more suitable targets to increase palmitoylation in HD. There are four known APTs: the cytoplasmic APT1, APT2, and APTL1, and the lysosomal PPT1, which mediates depalmitoylation prior to protein degradation.15, 16 It is currently unknown which APT depalmitoylates HTT and other HIP14/HIP14L substrates. Currently available small molecule inhibitors of APTs should be assessed for efficacy in improving HD phenotypes in HD models to further validate palmitoylation as a therapeutic target in HD. Future goals for therapeutic development would be to improve current small molecule drugs or to develop new drugs to target APTs in HD. 1Shirasaki DI, Greiner ER, Al-Ramahi I, et al. Network organization of the huntingtin proteomic interactome in mammalian brain. Neuron. 2012 Jul 12; 75(1):41-57. 2Culver BP, Savas JN, Park SK, et al. Proteomic analysis of wildtype and mutant huntingtin-associated proteins in mouse brains identifies unique interactions and involvement i n protein synthesis. J Biol Chem. 2012 Jun 22; 287(26):21599-614. 3Schaefer MH, Fontaine JF, Vinayagam A, et al. HIPPIE: Integrating protein interaction networks with experiment based quality scores. PLoS One. 2012; 7(2):e31826. 4Singaraja RR, Hadano S, Metzler M, et al. HIP14, a novel ankyrin domain-containing protein, links huntingtin to intracellular trafficking and endocytosis. Hum Mol Genet. 2002 Nov 1; 11(23):2815-28. 5Sutton LM, Sanders SS, Butland SL, et al. Hip14l-deficient mice develop neuropathological and behavioural features of Huntington disease. Hum Mol Genet. 2013 Feb 1; 22(3):452-65. 6Ohno Y, Kihara A, Sano T, Igarashi Y. Intracellular localization and tissue-specific distribution of human and yeast DHHC cysteine-rich domain-containing proteins. Biochim Biophys Acta. 2006 Apr; 1761(4):474-83. 7Huang K, Yanai A, Kang R, et al. Huntingtin-interacting protein HIP14 is a palmitoyl transferase involved in palmitoylation and trafficking of multiple neuronal proteins. Neuron. 2004 Dec 16;44(6):977-86. 8Hallak H, Muszbek L, Laposata M, et al. Covalent binding of arachidonate to G protein alpha subunits of human platelets. J Biol Chem. 1994 Feb 18; 269(7):4713-6. 9Smotrys JE, Linder ME. Palmitoylation of intracellular signaling proteins: regulation and function. Annu Rev Biochem. 2004; 73:559-87. 10Huang K, Sanders SS, Kang R, et al. Wild-type HTT modulates the enzymatic activity of the neuronal palmitoyl transferase HIP14. Hum Mol Genet. 2011 Sep 1; 20(17):3356-65. 11Yanai A, Huang K, Kang R, et al. Palmitoylation of huntingtin by HIP14 is essential for its trafficking and function. Nat Neurosci. 2006 Jun; 9(6):824-31. 12Ehrnhoefer DE, Sutton L, Hayden MR. Small changes, big impact: posttranslational modifications and function of huntingtin in Huntington disease. Neuroscientist. 2011 Oct;17(5): 475-92. 13Singaraja RR, Huang K, Sanders SS, et al. Altered palmitoylation and neuropathological deficits in mice lacking HIP14. Hum Mol Genet. 2011 Oct 15;20(20):3899-909. 14Butland SL, Sanders SS, Schmidt ME, et al. 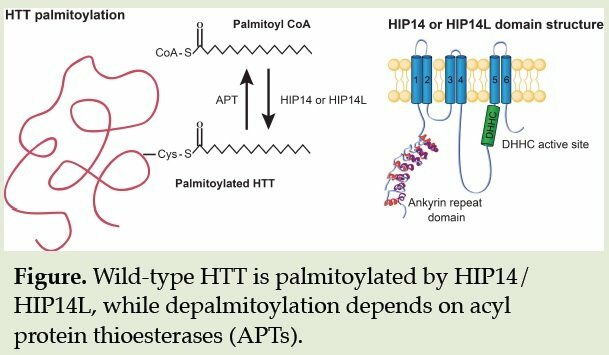 The palmitoyl acyltransferase HIP14 shares a high proportion of interactors with huntingtin: implications for a role in the pathogenesis of Huntington’s disease. Hum Mol Genet. 2014 Aug 1; 23(15): 4142-60. 15Young FB, Butland SL, Sanders SS, et al. Putting proteins in their place: palmitoylation in Huntington disease and other neuropsychiatric diseases. Prog Neurobiol. 2012 May;97(2): 220-38. 16Tian L, McClafferty H, Knaus HG, et al. Distinct acyl protein transferases and thioesterases control surface expression of calcium-activated potassium channels. J Biol Chem. 2012 Apr 27; 287(18):14718-25. This year’s 10th annual CHDI HD Therapeutics Conference, held February 23–26, 2015 in Palm Springs, California, brought together over a hundred researchers from academia and the private sector. The four-day meeting offered an exciting program covering a wide variety of topics related to HD research, from new methodologies to tackle fundamental biological questions, to an entire session dedicated to novel therapies targeting mHTT levels. The presentation of this novel science was accompanied by two significant and memorable events that were highly inspirational to all who attended the meeting. The first was the keynote presentation by Jeff Carroll, who shared his personal HD story. Subsequently, attendees were invited to view an extraordinary documentary called, “The Lion’s Mouth Opens,” made by independent filmmaker Lucy Walker. The film follows Marianna Palka, herself a filmmaker, through her journey of being tested for HD and learning that she is a gene carrier. The meeting kicked off with presentations by Dr. Robert Pacifici, Chief Scientific Officer, and Dr. Cheryl Fitzer-Attas, Vice President of Clinical Research at CHDI. Together, the speakers gave an account of the research that CHDI has sponsored, current and future programs emerging from their various initiatives and collaborations, and the platforms that have been made available through their various endeavors. In a session titled “Illuminating HD biology and a next generation of therapeutic interventions,” Dr. Hong-Wei Dong presented his remarkable work decrypting complex brain connections using computational and microscopy approaches. Dr. Myriam Heiman described a new technique referred to as “SLIC,” with which her laboratory studies the function of individual genes in living animals. They are working to determine why some brain cells are more vulnerable than others in HD. The work of Dr. Juan Botas on HD Drosophila, which they breed with various fruit fly species characterized by other genetic mutations, is helping isolate changes and responses that are truly HD-specific. Dr. Jong-Min Lee outlined his work on genetic modifiers. Industry leaders described novel mHTT-lowering therapies. Dr. George McAllister, Senior Director, Biology at BioFocus, presented a session on his company’s efforts to screen a vast number of chemicals to identify those that show promise in reducing the expression of mHTT. Dr. Lisa Stanek from Genzyme presented their small interfering RNA approach to mHTT lowering, while Dr. Frank Bennett of Isis Pharmaceuticals presented their antisense oligonucleotide approach. Dr. Geoff Nichol of Sangamo Biosciences gave an update on the use of zinc finger proteins and planned clinical trials. The session concluded with CHDI’s Dr. Douglas Macdonald, who described their efforts to identify biomarkers related to HTT silencing. The last day of the meeting was dedicated to clinical research. Dr. Gilbert Di Paolo presented his work on specific lipids identified in the blood of participants in the TRACK-HD study. Dr. Edward Wild described his work with cerebrospinal fluid biomarkers, showing a positive correlation between mHTT levels in CSF and HD clinical progression. Dr. Michal Geva from Teva gave an update on their ongoing trials, including the PRIDE-HD and the LEGATO-HD trials. Dr. Sarah Tabrizi summarized her group’s findings in the TRACKOn-HD study. Using cerebral imaging, the group identified striking compensatory mechanisms that take place in the brains of HD patients years before symptoms develop. They are currently exploring the use of neurofeedback techniques that aim to train patients to modify their brain activity to improve performance. Dr. Marios Politis presented on his work on PET imaging, investigating overlapping brain networks involved in HD. Finally, Drs. Ray Dorsey and Bernhard Landwehrmeyer reviewed recently halted, ongoing, and future clinical trials. Among the highlights of this 10th meeting, attendees had the privilege to hear featured speaker Dr. Story Landis, former director of the National Institute of Neurological Disorders and Stroke. The meeting concluded on an entertaining note with a lighthearted award ceremony.